"The first judge to sit in the high court wearing a turban instead of a wig will hear his first cases today. Rabinder Singh Q.C., 39, who will sit today as a deputy (part-time) high court judge, is also thought to be the youngest person to sit as a judge in the high court. Mr. Singh, who was appointed a deputy high court judge last Dec., was one of a group of barristers who founded Matrix chambers in 1999. The group also included the prime minister's wife, Cherie Booth Q.C. Mr. Singh is one of a small number of barristers who wear turbans in place of wigs when arguing cases in court. England's senior judiciary has been described as 'pale, male and stale' and there has never been a non-white full-time high court judge. A turban-wearing Sikh, Mota Singh, served for some years as a circuit judge." "Rabinder Singh, who is in the running to become the first full-time high court judge of Asian extraction, has been one of the leading voices in the debate over the legality of armed intervention in Iraq, having argued in a series of legal opinions that war would be illegal without a fresh resolution from the U.N. security council. He made an unprecedented application last Dec., on behalf of the Campaign for Nuclear Disarmament, for a high court declaration that it would be unlawful for Britain to go to war with Iraq without an explicit U.N. resolution authorising it. The court turned it down. One of Britain's leading experts in public and administrative law - the law relating to government departments and public authorities - he will be hearing a number of applications at the Royal Courts of Justice in London today for permission to challenge immigration decisions." "As a barrister, he represented the civil rights organisation Liberty and the Joint Council for the Welfare of Immigrants in the case the government lost in the appeal court over the refusal of benefits to refugees who fail to claim asylum at the first reasonable opportunity. 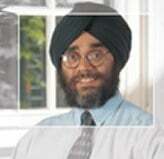 Mr. Singh was born in Britain to Sikh immigrants from India. He grew up in a working-class part of Bristol and attended Bristol grammar school. At Trinity College, Cambridge, he earned a double first in law, then spent a year at the University of California at Berkeley, where he became interested in constitutional law and human rights." "He was a colleague of Ms. Booth in her former chambers, 4-5 Gray's Inn Square. Most of his practice involves acting either for or against government departments. He is a visiting professor at the L.S.E. [London School of Economics] and until recently held a part-time post as the independent monitor of the entry clearance system, which required him to make random checks on up to 1,000 visa refusals a year. A spokesman for the Lord Chancellor's Department said: 'We are fairly certain it is the first time a judge wearing a turban has sat in the high court. He is also believed to be the youngest.' "